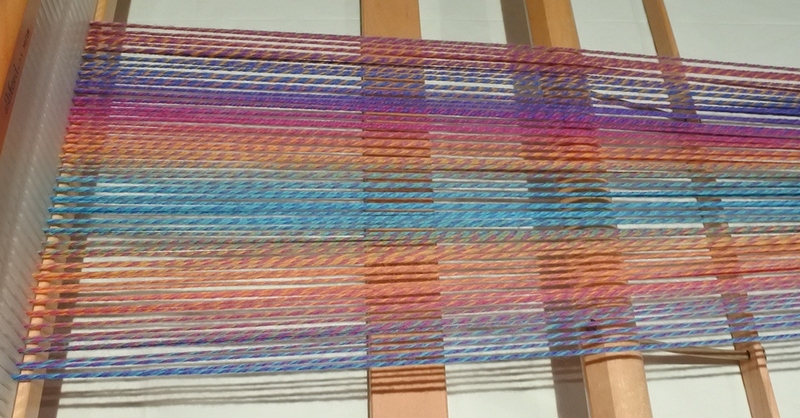 You might have guessed that I haven’t been weaving much recently. Thus the lovely sound of “crickets” on the bloggy. But just because I’m not weaving, doesn’t mean I’m not thinking about weaving, or looking at the loom and going “you’re naked – you need dressing”. Today, however, I had to pack the loom and all the bits into it’s nifty carry bag and it felt wrong. Like I was saying out-loud “no weaving to see here, move along”. Of course no weaving can happen in my craft room while it undergoes a bit of renovation – that’s why the loom is in a bag for a few weeks. What are the odds that I will end up dressing it and weaving in the loungeroom again? Just to prove the point that I don’t agree with this enforced non-weaving period. Yep, that’s quite likely. So this is fresh off the loom! An olive green scarf with grey and blue stripes so it has a bit of plaid action going on. I like it. The blue is actually more subtle in real life than in this pic, but I’ve had a cold and it was too much energy to mess around with the camera! The image gives most of the idea. 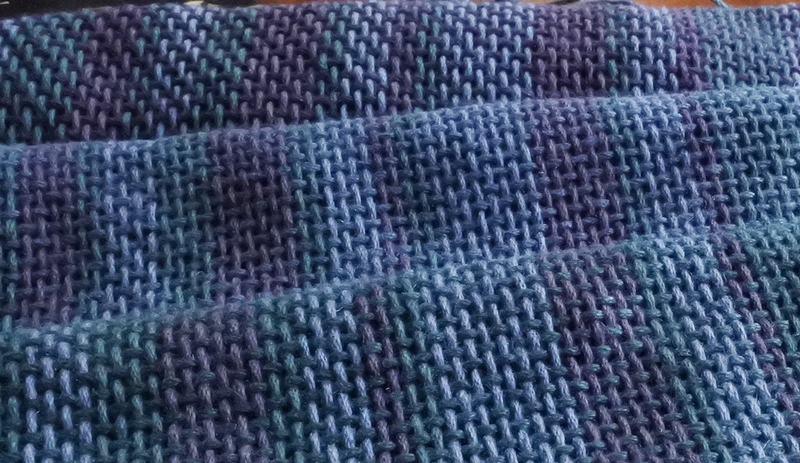 One aspect of this scarf that I’m very pleased with, is that I deliberately avoided symmetry by changing up the colour order for each stripe and I not spacing the stripes across the width too evenly. The result works well. I think I can say the first “not my colours” scarf is successful! 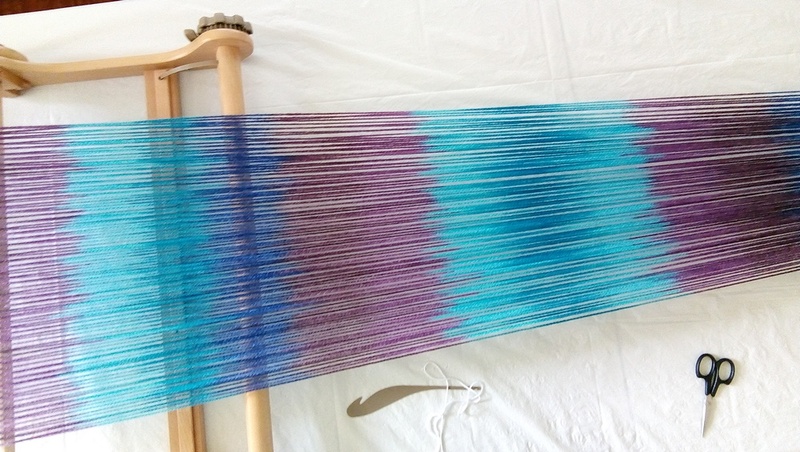 This week on the loom I am trying to weave a scarf in colours that I am never drawn to and never work with or wear. It’s been a challenge! 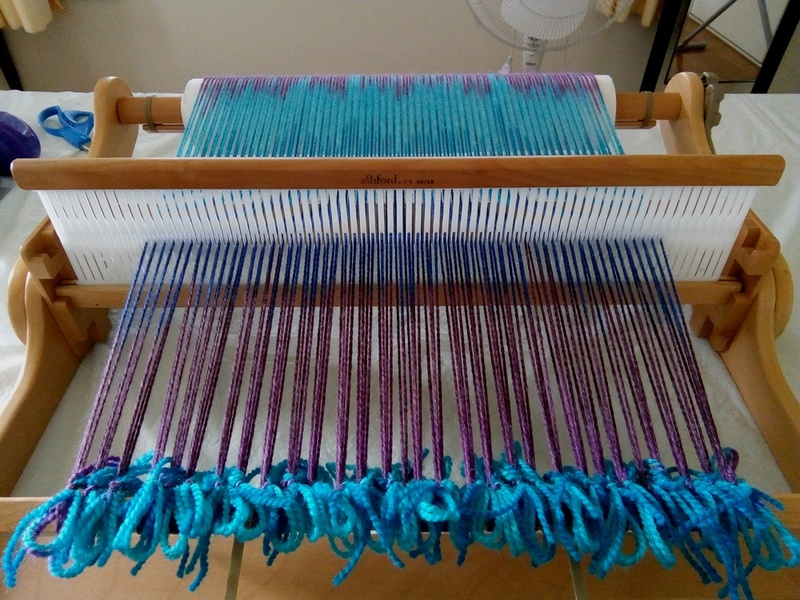 I’ve tried with my weaving not to spend all my time in the colours I’m most comfortable with. Tried and thought I’d done well. Then I found myself looking at some muted “winter” coloured yarn and realised I’d never gone far enough outside my colour comfort zone. These were colours I’d never even think to buy! So I bought one – a dark olive green – and I’m adding a little blue and grey as stripes. The funny part is that normally I have a great sense of how colours will go together. Not this time! 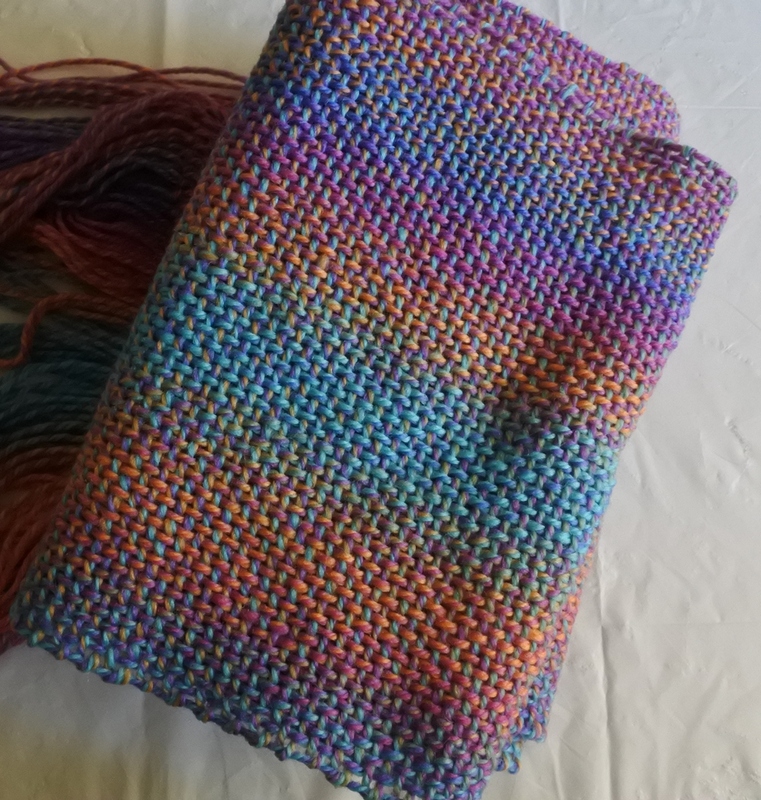 I stared at the colours and twisted the yarn this way and that for ages before feeling confident it’d work. Now it’s on the loom it seems to be going fine and I’m liking the subtlety. 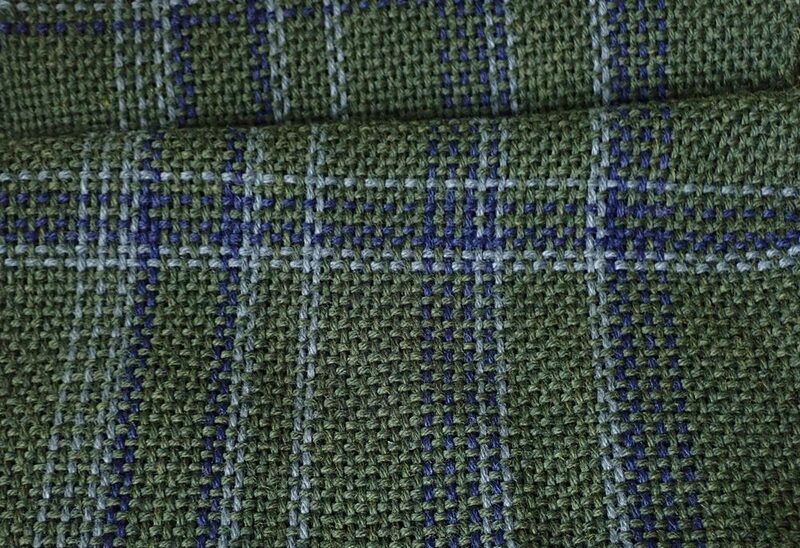 Pictures will follow once I’ve woven more! Some time ago I did a post on the “bendy scarf”. 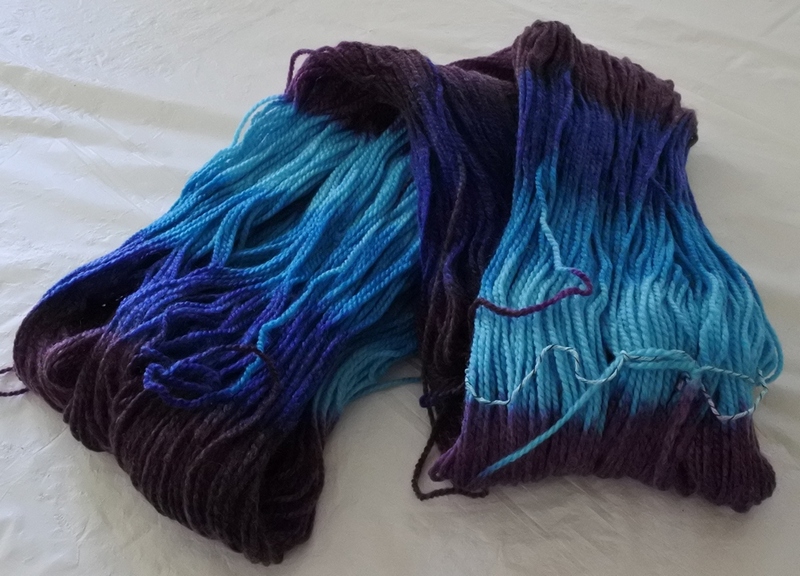 It was not the yarn’s fault the scarf had failed – totally knitter’s error – but I’m beginning to suspect this yarn has been cursed by an evil yarn fairy. 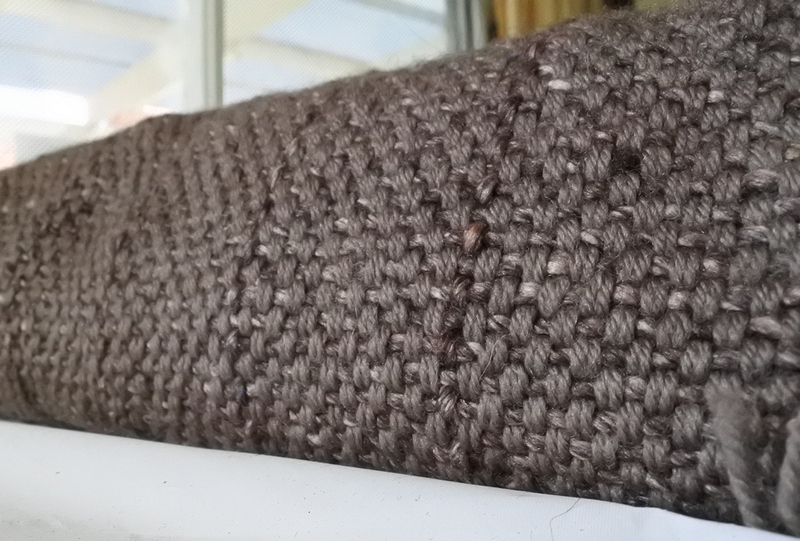 The warp only took half the yarn I had left, so I decided I’d use the cotton for weft as well. Because I didn’t have enough of any one colour to do the whole thing, I contemplated a plaid, but I’m not a huge plaid fan. Finally I decided on blocks (roughly 3rds) of each colour. 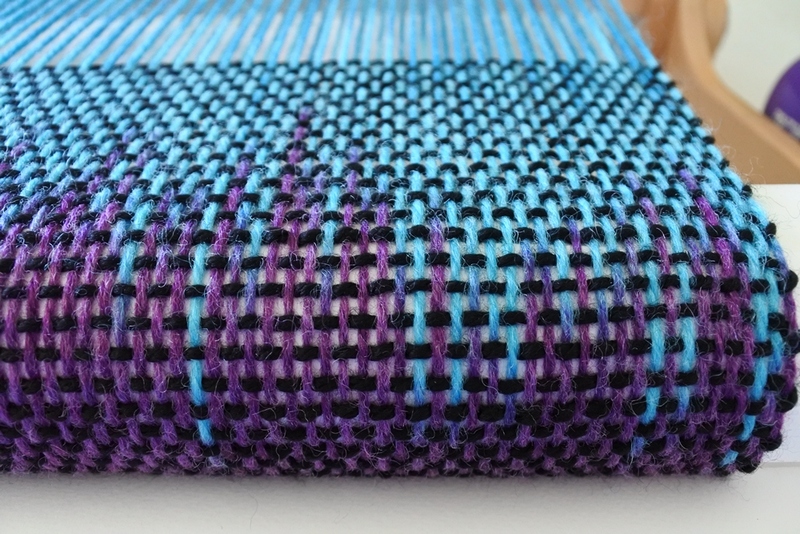 The different weft colours are so subtle which I love. But 3rds did not happen! I’d already transitioned from the 1st colour to the 2nd when I realised I had gone wrong… which means I was too far in to start over. What I do love about this project though, is it’s a great experiment in colour. Not only are the colours much duller than most yarns I use but they are so close in value that the weft really does blend beautifully. I also got to play with gradually transitioning the colours. Sadly this was also a casualty of my messed up calculations, so I’m not in love with how they came out, but the upside is that I’ve now tried the technique and know what not to do! And where did my calc’s go wrong? No idea. 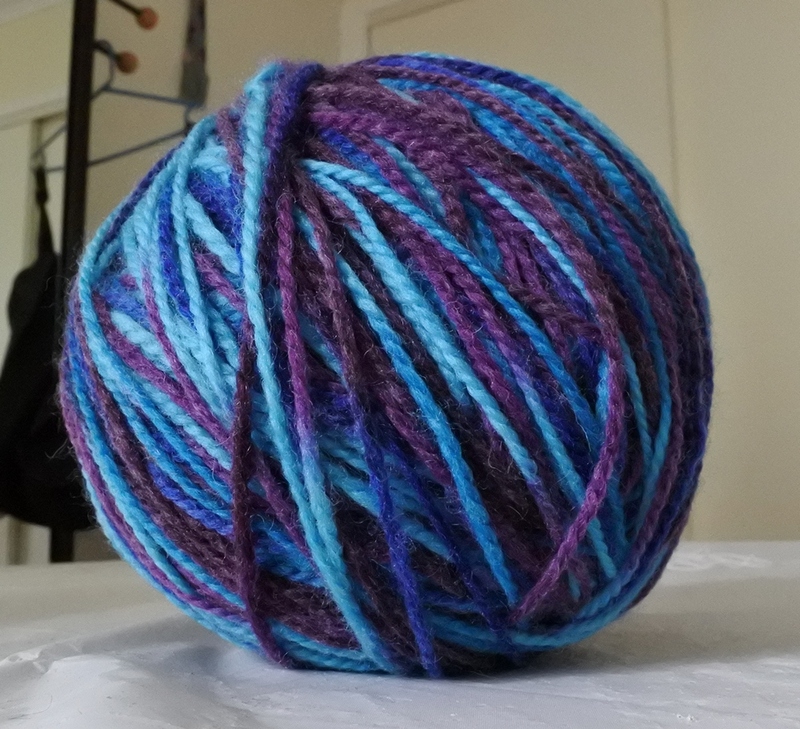 I suspect I flipped some numbers around when I weighed the yarn originally… Ah well. I still have a new stripey scarf! Posted on April 29, 2018 Categories learner weaverTags 2 shafts, bloopers, colour, my weaving, stripesLeave a comment on Can yarn be cursed? 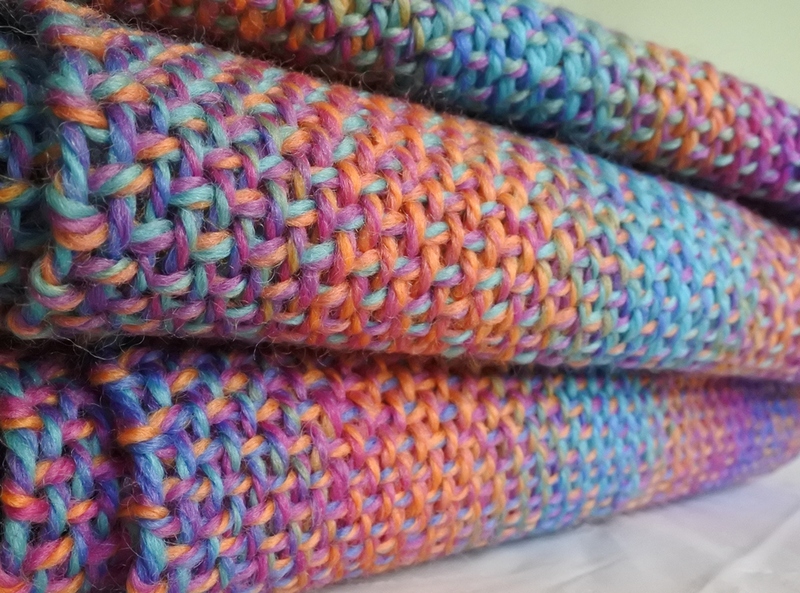 The pooling project came hot off the loom this morning and I’m happy. Very happy. The pooled colours have come up a treat and, while I can’t seem to take a pic that is colour accurate (! ), it looks amazing. It all led to this! 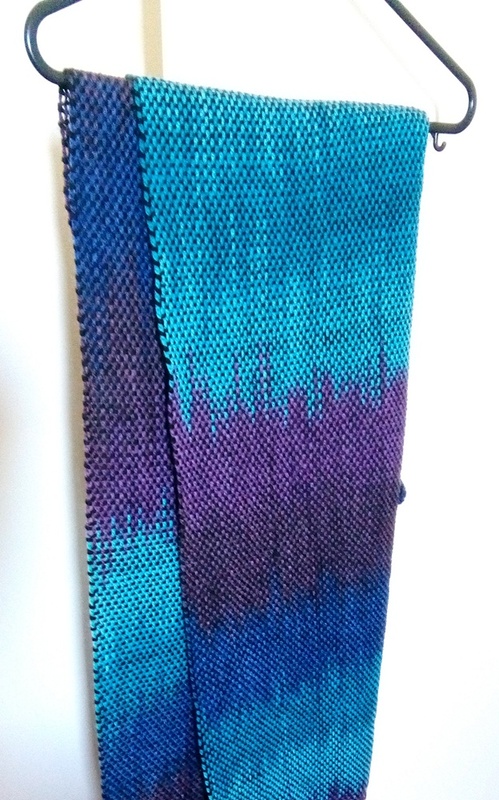 A very nicely banded scarf with lovely spiky colour changes. Aligning the colours did take a bit of time and, truth-be-told, more than one go. Though, once I’d figured out how to best handle the skein’s anti-pooling measures it was a doddle! Some tension problems occurred; partly because I was tweaked the alignment as I tied-on and partly because the sticky yarn wanted to clump. 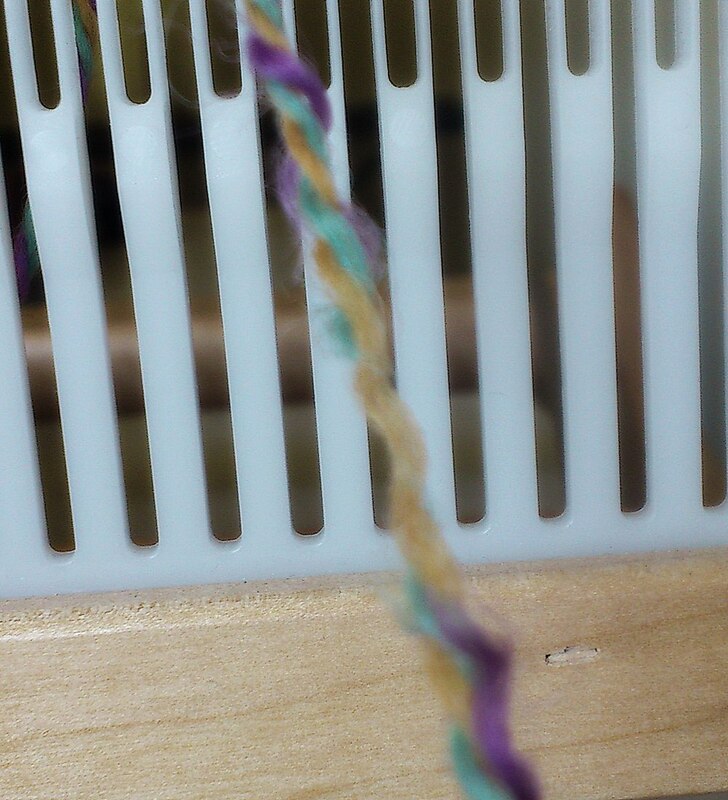 I should probably have untied the whole thing and re-done it, but I – of course – wanted to get on with the weaving. Still, I don’t think it’s harmed the scarf. I lurve it! On the loom it was looking so much like a pencil or charcoal rubbing of some highly textured surface that I almost stopped weaving to get out some charcoal and paper; such was the inspiration! 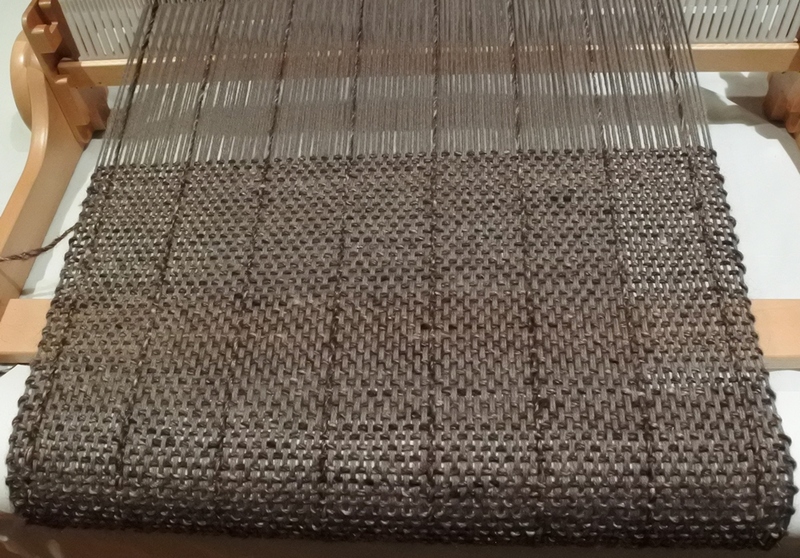 Thankfully, I kept weaving and am very happy with the result. Of all the colours of that Noro Silk Garden comes in, you might think me mad to have picked the “Solo” and in brown (!!!! ), but this was a yarn that just spoke to me. I’m not much of a browns person, but I do like the colour and particularly flecked like this. Being me though I’d forgotten that you can’t warp with this yarn! (I know, I know…) Thankfully, my stash had an appropriately matching 4ply in it. I could have put grabbed the appropriate reed and used the 4ply as 4ply, but I didn’t think the sup’ warp Noro would survive that much abrasion. So I threaded it double using a 30/10 reed. So happy with the result. 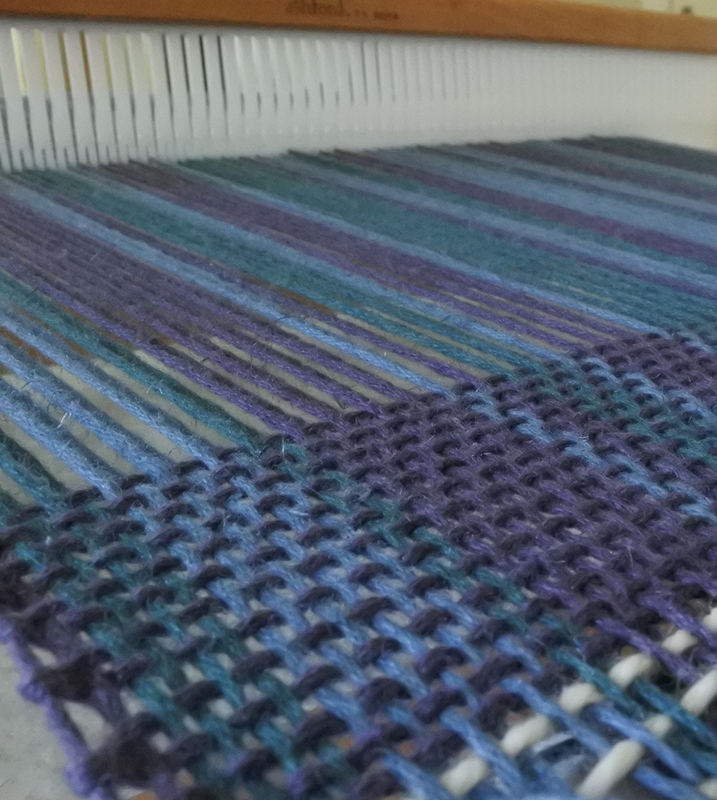 Such is the serendipity of my approach to weaving!